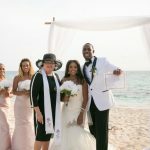 Getting Married in Cayman ...Is it legal back home? Probably the question I get asked most often about getting married in Cayman is "is it legal back home?" The answer is a resounding YES! Let me walk you through what happens. 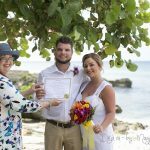 First your marriage must be performed by a person who is licensed by the Cayman Islands government as a "Marriage Officer". 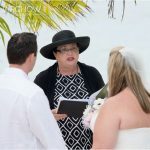 I get quite a few requests from couple who want to bring their own officiant with them. 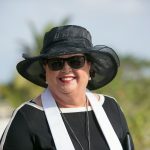 That's fine...as long as you understand that whom ever says the words, your Cayman Marriage Officer has to do the paperwork which makes it legal. As a visitor, you must be married by a Special Marriage License. Your Marriage Officer will do the documentation for this, and then sign that everything is in order. You will be given the Special License to keep as a souvenir. It is rather nice, as it has the seal of the Governor of the Cayman Islands. There are other arrangements in place for residents, and one requirement is a time requirement for the Banns of Marriage to be posted. Visitors can be married the same day they arrive, as long as I have time to get the Special Marriage License. Special arrangements can be made for visitors who want to be married on a weekend or Public Holiday, when the Governor's Office is closed. After the ceremony, you have to sign three documents. Ladies, you sign your maiden name, or the name on your documents. You don't sign your new married name at this point. The first document is a certified copy of the Marriage Certificate, which is yours to keep. It will have the couple's signatures, the witnesses signatures, and my signature and seal as a Civil Registrar of Marriages aka Marriage Officer. The next two documents will be handwritten, and you should check that all your details, especially your legal names, and your postal address is correct. One of these documents is kept in my Marriage Book, and I file the Duplicate Marriage Certificate with the Registrar General. This is akin to your County Clerk, or Public Records Office at home. When your marriage is filed, I make an application on your behalf to get your Registered Marriage Certificate. This document will be sent to you by mail, within 3 working days of your marriage. This is the legal document you will need to have your driver's license changed to your married name, your passport changed etc. It will have the seal of the Registrar General. a watermark of the Cayman Islands crest, and on the back it will say "Secure Document." Some European and Asian countries require an Apostille. If in doubt, be sure to ask. The USA and UK do not require an Apostille. Many people tell me they want to be married "just the two of us". Well, under Cayman law you must have two witnesses over the age of 18. Here is a picture of me explaining to some witnesses where you have to sign. If you don't have witnesses, then let me know and I will provide them. You should give these witnesses a small tip ($20/$30) as a token of appreciation for them getting dressed nicely and coming out specially for your wedding. This is what your certified copy looks like. I like to take a picture of what I call "The Proof"! If you have any questions, email me at mywedding@candw.ky.